Black Isle's classic PC RPG that allows players to create an entire Dungeons & Dragons party is now available on GOG.com. Good Old Games keeps getting one old-school RPG closer to having the world forgive it for its sins. After starting off with Baldur's Gate, and following it up with Planescape: Torment, GOG.com has unsurprisingly made Icewind Dale available on the service. 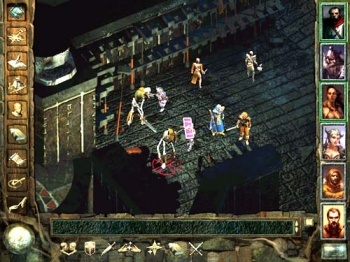 What differentiates Icewind Dale from the other two GOG titles is that it allows players to create an entire party of up to six. Baldur's Gate only allows the player to create one character, while Planescape: Torment has every player take on the role of the Nameless One. Want six thieves? I don't recommend it, but go ahead. Icewind Dale still has a story, but it relates to a general group of adventurers rather than specific personalities in your party. Players must save the land from evil while taking on the game's many dungeons however they see fit. Icewind Dale also uses BioWare's Infinity Engine like its GOG counterparts. The GOG version includes both of Icewind Dale's expansion packs, which makes this a pretty content-rich release. Players can even take their adventurers through the game's storyline a second time with experience points and equipment intact to face tougher foes and keep leveling up. If you're into RPGs like Baldur's Gate, Icewind Dale is a more customizable, must-play brother. With GOG apparently releasing one classic Infinity Engine game per week, what could be next? Baldur's Gate 2? Icewind Dale 2? Sadly, there are a limited number, so eventually GOG will have to find something else to beg forgiveness with.